The muskrat, I now realize was a possum. The possum is causing me an unreasonable amount of anxiety and although I try to meditate it away, he infiltrates my dreams in various animal forms. They walk on water-unaware it is impossible to do this- and through their lack of awareness, they perform the impossible. 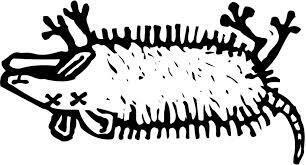 In my awake life, as I was driving and only a block away from home, I noticed a dead possum, its long tensile tail trailing along the edge of the road and curling up the curb. Whenever I see the hawk, I always feel like he is the same hawk who comes to visit me and encourage me to have a new perspective. But this dead possum, I don't know if he's the same guy who hid out in my garage the other night. I don't know at all.